Daddy, will you read me a bedtime story? Pleeeeeease . . .
Once upon a time, an ivory skinned princess from a cold, grey, snowy, peninsular land called “Michigan” traveled to the warm, sunny, paradisial island of Oahu. There, she met a golden skinned commoner from the land of her ancestral enemy, “Ohio.” Unexpectedly, rather than engaging one another in mortal combat, they began to engage one another in an elaborate courtship ritual. “That is a wild boast!” she scolded. But, it was true. And, the princess and the pauper, hand in hand, climbed mountains together, swam with dolphins together, traveled the world together, and, yes, soared among the clouds . . . together. They fell in love. They were married. They raised beautiful, intelligent, well-mannered children together. And, of course, They Lived Happily Ever After. 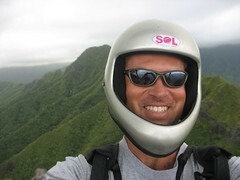 Hillery & I would like to announce to all members of the Hawai’i Paragliding Association our intention to be married on Saturday, 7 June 2008. We were going to wait until August, 2008; however, Hillery & I would, also, like to announce to all of the members of the Hawai’i Paragliding Association that in September 2008, you are all going to be Aunties & Uncles!! We decided that we wanted to start a family. She thought it would take several months . . . but, it took several weeks instead. Yes, yes, the swimmers are strong!! Therefore, the August wedding has been moved up: very much to do, very little time. We have given the matter a great deal of thought. We would like to be married in Hawai’i. We would like to be married on the beach. We would like all of our friends to be present, enjoying food and drink and laughter. To tell the truth, I might even skip out on my wedding reception if it looked like a good downrange day. Of course, Hillery might well beat me to a bloody pulp if I were to do so. I’ve already told a few people about our plans and, in true HPA fashion, offers of assistance and support have been made: such as tents, coolers, tandem wings, and an offer by a professional make-up artist to “Do Hillery’s make-up.” We appreciate it more than we can express. We have been brainstorming about all of the things that we will need. Hillery has compiled a list of wedding related items (which I expect to grow & grow & grow.) We ask that, if anyone can assist us with the making of this event, please leave a comment here or call Hillery or myself. Help with food . . . BBQ Masters! I will be giving periodic updates as the plans develop. Please feel free to call me or Hillery or e-mail us. We would like to know who plans to attend, so that we can gauge how much food to buy. Aye, you like steak? Fish? Cake? So, in a few months we will go from wild singles to husband & wife . . . mommy & daddy . . . pretty cool, huh? Any names (or nicknames) already?? Way to go Pete/Hillery..., Congratulations!!! I can help with beach cleaning & set-up. Can bring:- Pop up Tent, Table, Chairs,Medium Webber Grill & Food Warmers. Can anyone get a camping permit? I'll help with something just not sure what. Perhaps I'll document the event. I say we all apply for permits for camping and get them all or mostly all. It's far enough out that we could probably do it. Congrats Hillary. You finally got that stubborn old goat. Enough bonking on that thick skull and there you go. Awesome, you two. It is about time. Sometimes you have to go the long way to get to the heart of the matter, at least you got there. Way to go, I knew you could do it. And to be an Auntie....Yeah hoooo. I will help with whatever I can. Tear down and beach cleaning sound good to me. OMG!! Talk about jumping in with both feet. Congratulations to you both, and best wishes for a lifetime of connubial and parental happiness. Welcome to the club(s)! Congrats to you both!! Sounds like you've made a great decision. I will be deployed to the Mid East until the first week of June but I hope to make it!!! Count me in for the festivities and whatever else u may need help with. Tandems, BBQ master, coolers, tent, whatever. To think I was looking forward to the Rat race. This beats dat. I am overjoyed and happy for you both!!!!! Yay for Hillery and Pete! I'm especially happy that you've moved the date up, as I must leave our fair shores the following week to pursue my own Happily Ever After fairytale. I very much look forward to sharing your joy amongst our friends. Help with food . . . assistant to the BBQ Masters! I am hereby volunteering to be a Camping Coordinator (although I can't actually go downtown on the best day). I think it would be good to get as much of the park for us so we can revel all day without worrying about bothering others or taking their parking spots nor have anybody worry about driving home. I can go for permits on Monday May 12th, but better if others can go on Wednesday the 7th. "permits can be applied for no sooner than 30 DAYS in advance"
You're supposed to have the drivers license number or "photocopies of IDs for all adults listed on the permit application". "Maximum 3 parking permits [per application] for Kahana Valley State Park"
I'll try to gather as many names and ID numbers as I can, fill out the forms, and distribute them to the folks who can go downtown on the 7th. Thank you all so much for all your support and offers for help. It means alot to me. Yeah, I came here in November for a month or two, which means I'll still be here in June, so count me in with whatever help you need !! Congratulations PETE and HILLARY. If you thought life was an adventure up to this point just wait a year, then 2 then 3. Ive been a flower girl at least 4 weddings and think i have even put petels on target at a one of them. I would love to do it on your special day as well. Count me in for what ever you need. PS perhaps its time for "papa pete"
Time for a new call sign. We have tables, chairs, ez corner tent, coolers, kayak for the river. Will apply for camping permit whoever is doing it let me know will give you my info that is needed. My girls are looking forward to helping you out too. Keep in touch with Donna on the guest room. Congrats you two! Sorry for the late response.... Jen and I are heading for the mainland in June and I was so afraid we'd miss your wedding. We've managed to juggle a few things around, and now we're not flying out until late night June 7th. So we'll be there! Great choice of venue too :) We also had a local-kine beach wedding/BBQ and it was great. Pedro and Hillary, Q and I wish you both a long and happy life together. I'll be honored to help out in whatever capacity you require! Reminder to mark your calendars for June 7 at Kahana! Are you interested in having a bonafide parking permit for the campers parking lot nearest the LZ on the big day? Are you interested in camping? Think you might be a little zonked after a day of flying and luauing revelry? Want at least the option to stay the night and save the drive (and DUI) for another day? Sign on with us for a spot on the camping list. It won't cost you anything but the time to get me your name and number. Call my cell 2-5-5--3-3-6-5 or email akers4_AT_ee.hawaii.edu to sign up. We can have up to 10 people (including kids) per site, and 5 parking permits per site. But to be included, we must get your name and number on the permits. We would like to get AT LEAST two, preferably three, or even more campsites so that we and our friends have room to spread out. I will be going super early on Wednesday, May 7 to reserve campsite #1 for Friday and Saturday, June 6 and 7. I need at least two other folks who can go early that day (preferably be waiting outside before 8 am at the camping permit office on Punchbowl and Beretania) to reserve a couple more sites. We will be going for sites 1, 2, 3, and so on.